This unit will cover how to set up three way conference calls with Fastcall. This is necessary to use the Fastcall features listen-in and warm call transfers, but does have some trade-offs. Fastcall uses three way conference calls to power two features: listen-in and warm call transfers. A conference call is handled differently to a normal call by Twilio – it takes longer to set up and costs more than normal calls. Using these features requires the call to have been started as a conference call, and because there is no way of knowing whether you will need to listen-in or warm transfer a call before it has started, all calls (to given Users) have to be started as three way conference calls. When an inbound or outbound call is made, a conference is started and two participants are added. Then, when the listen-in or warm call transfer feature is activated, a third participant is added. Turning on this feature will increase the cost of calls. As well as charging for each call connected to the conference, Twilio will charge a per-minute fee for the conference itself. This means that call costs will at least double when using this feature. Whilst the functionality is stable and proven, conference calls are inherently more complicated than normal calls – there are more participants, and Twilio is doing more work behind the scenes. This means there’s more to break. Consider alternatives to listen-in and warm call transfer, such as reviewing call recordings and cold transfers. You can also limit which users or groups get access to this functionality. 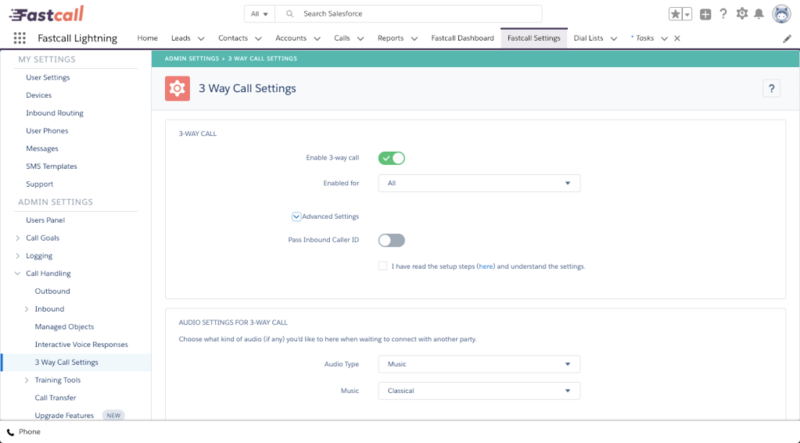 Three way conference calling is enabled and controlled in Fastcall Settings > Admin Settings > Call Handling > 3 Way Call Settings. You can select a specific User or Group for three way conference calls. As mentioned, conference calls behave differently to normal calls, so you may wish to limit which Users get this functionality. This setting makes Fastcall pass the original inbound caller ID to the new person. So, for example, if Contact Alice makes an inbound call to User Bob, and then User Bob makes a warm transfer to User Charles, Charles will see that Alice is calling him. If this feature is left off, Charles will see that Bob is calling him. Turning this feature on requires additional permissions to be granted in your Twilio account. It’s recommended that you set some audio, otherwise call participants may think they have been disconnected while Twilio makes the other connections involved in the conference call.